I was awake a lot last night, thinking about what home means...to me, to you, to so many who don't even have one. The moon was blasting in my window, urging me to get up and write. I declined. Now, in the light of day, it doesn't seem as pressing as it did at 2:3o in the morning, but I know it is. I have now been here with my family for almost four months...months that have flown past. I spend part of my time staying at the home of my son, so I now have the feeling of a new home to add to my list. One of you generously offered to me a few months ago that home is where the heart is. You are so very right. 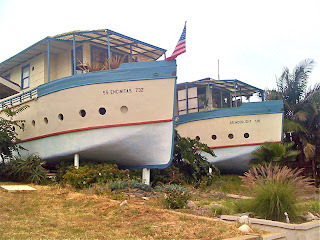 In the little downtown area below my house, there are some non-traditional homes I've long wanted to share with you. I can't recall the history of how/why they were built just now...lo siento. Perhaps in another posting? 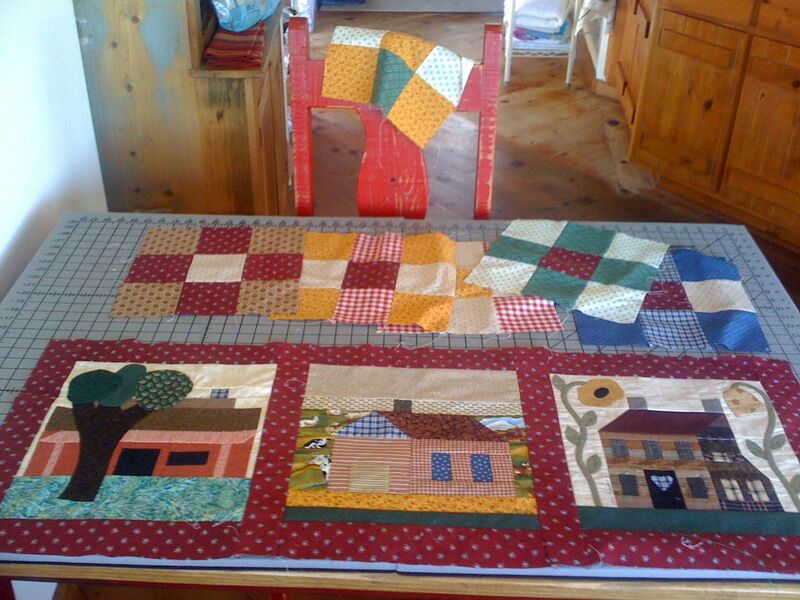 Spare moments this last week have been spent starting quilts for homes for folks I'll never know. I have found some wonderful quilting blogs this summer, and am once again reminded of the enormous heart and generosity of folks in the fiber world, joining together to do hand work to help others. My current focus is using up old quilt blocks I got in a swap back in 1992 (yes, they've been waiting all these years to be used). I have twelve blocks, so I have assembled them in groups of three, to border four separate smaller quilts. I am going to donate these quilts to a project called BASICS, started by quilter and fiber artist Victoria Findlay Wolfe when she learned of the needs of a community based group in the south Bronx (BASICS/Promesa) that is helping disadvantaged Latino families. She designed a simple house block and asked bloggers around the world to donate a block if they would like to join in. She received 550 blocks and to date, has generously assembled 50 quilts with them, some of which will be auctioned off in a fundraiser in early September if you are in that area. Victoria's quilts are then quilted by Jackie at Canton Village Quiltworks. Entire quilt donations are also being accepted...of all sizes...if you are interested in helping out, be sure to visit the BASICS website and check out the specifics on what they're looking for before you get started. I plan to spend all of today working on this quilt. While I'm sewing, I'll count my blessings that I have so many homes in my heart, so many friends and family I love so much, and the opportunity to help others feel as secure as I do. I wish you a good weekend! The old expression "Home is where the heart is" may sound trite, but it is so very true. A house is just a structure, but a home is wherever your family and/or friends are - and that can be anywhere! Enjoy your day quilting for a great cause. Bless your heart. You sound a little homesick. Perhaps going to a Latino Grocery Store or restaurant will bring those "homey" smells back to you and you will feel "more at home". The odors (or close to it) of NM. Years ago, I was in California on a little mini-vacation. My husband and I were visiting the wineries of Napa/Sonoma. (one of my dream things to do) anyhow............... We were driving along.....our bellies full of delicious wines and sourdough and salame.......and we opened the windows of the car as we drove thru the area. After about 10 minutes.....I shouted for DH to stop the car!!!! Ahora!!!!! I climbed out and took off into the woods. He didn't have a clue. About this time, a CHP pulled up and wanted to know just what he was doing. He told the officer he didn't really know --- but had followed my instructions - stopped the car and my wife bolted for the woods. About this time......the officer headed to the woods to investigate and here I came. My whole shirt was still on my body, but I oviously had picked something and was using my shirt front for a little pouch. I had quite a haul! He ask me what I had and what I was doing and I told him we had been driving along and I smelled a smell I had not been around in 50 years!!!! I knew I had to go find the source of the smell. What had tickled my nose was the smell of eucalyptus!!!!! I had not smelled this for 50 some odd years, since I lived in Guerneville as a young child of 4. Instantly that odor takes me right back to my childhood......when I remember the good ole days and the exploring I used to do with my dad. As I sit at the computer......I try to remember that fragrance........but alas, I cannot. Those pods have long since dried out and I realize, it is time again, to return to CA to get some more. Just the mere thought makes me homesick for a time and space I will never forget. Ahhhhhhhhhhhhhhhhh just I may be a bit homesick too. Thanks for another thoughtful reflection. The generosity of people in the fiber community is truly amazing. And I'm with you on the smell of green chile roasting in Taos. There's nothing like it! The other "feeling" I get is when the plane touches down in Las Vegas. I lived there in '55-56. Anyhow.......as soon as I am checked into the hotel, and I whisk open the drapes and see those mountains................it is like coming home to mama's bosom. I get the feeling of being cloaked in a very familiar feeling. It touches me the same way every single time. I always have to have a good cry. Oh gosh...............now my tastebuds are going to be thinking about green chilis!!!!! MMMMMMM I have not ordered any yet.